You are here: Home>Archive>Iain Cawthorne Collection>Photographs taken by Iain Cawthorne of the designated area of Milton Keynes (c.1970s).>Photograph of Bradwell Abbey Farm (1971). Photograph of Bradwell Abbey Farm (1971). Group: Photographs taken by Iain Cawthorne of the designated area of Milton Keynes (c.1970s). Item: Photograph of St Mary Magdalen Church, Willen (1971). Item: Photograph of St Mary Magdalen Church Willen (1971). Item: Photograph of St Mary Magdalen Church Willen designed by Sir Robert Hooke (1971). Item: Photograph of view from Willen churchyard (1971). Item: Photograph of Manor Farm Willen (1971). Item: Photograph of Willen Village (1971). Item: Photograph of farmhouse in Woolstone (1971). Item: Photograph of 14th century Woolstone Church (1971). Item: Photograph of Woolstone School (1971). Item: Photograph of farm at Woolstone (1971). Item: Photograph of farm and farmyard (1971). Item: Photograph of country road and farm (1971). Item: Photograph of church near Woughton on the Green (1971). Item: Photograph of church looking towards Woolstone (1971). Item: Photograph of field with Holy Trinity Church Woolstone in the distance (1971). Item: Photograph of Georgian farmhouse on Woughton road (1971). Item: Photograph of farm buildings opposite Georgian farmhouse (1971). Item: Photograph of farm buildings behind Georgian farmhouse (1971). Item: Photograph of road through Woolstone towards the church (1971). Item: Photograph of road with cottages in Woolstone (1971). Item: Photograph of road and Crossed Keys pub in Woolstone (1971). Item: Photograph of barn and Crossed Keys pub in Woolstone ((1972)). Item: Photograph of farm in Woolstone (1971). Item: Photograph of cottage near Woolstone (1971). Item: Photograph of farm buildings at Woolstone (1971). Item: Photograph of farm building and tractor at Woolstone (1971). Item: Photograph of farm at Woughton on the Green (1968). Item: Photograph of derelict farm Woughton on the Green (1971). Item: Photograph of Peartree Farm Woughton on the Green (1971). Item: Photograph of Woughton on the Green (1971). Item: Photograph of Manor Farm in Woughton on the Green (1971). Item: Photograph of North Cottage in Woughton on the Green (1971). Item: Photograph of cottage in Woughton on the Green (1971). Item: Photograph of fields from Woughton on the Green (1971). Item: Photograph of fields towards Peartree Bridge (1972). Item: Photograph of Woughton on the Green (1972). Item: Photograph of Peartree canal bridge and towpath (1972). Item: Photograph of barn at Peartree Bridge (1972). Item: Photograph of Old Rectory, Peartree Bridge (1971). Item: Photograph of fields from Peartree Bridge (1971). Item: Photograph of lane and fields from Peartree Bridge (1972). Item: Photograph of country lane from Woughton (1971). Item: Photograph of country lane looking towards Woughton (1971). Item: Photograph of fields looking towards what is now Eaglestone (1971). Item: Photograph of site of Coffee Hall (1971). Item: Photograph of derelict barn in field site of Coffee Hall (1971). Item: Photograph of farmhouse at Simpson (1971). Item: Photograph of cottages in Simpson village (1971). Item: Photograph of cottages at Caldecotte (1971). Item: Photograph of Caldecotte farmhouse (1971). Item: Photograph of Caldecotte Farm buildings (1971). Item: Photograph of Caldecotte Farm and farm buildings (1971). Item: Photograph of farmhouse at Walton (1971). Item: Photograph of Manor Farm Milton Keynes village (1971). Item: Photograph of Milton Keynes Village (1971). Item: Photograph of fields between Milton Keynes and site of Central Milton Keynes (1971). Item: Photograph of Milton Keynes village road going into the village (1971). Item: Photograph of half timbered thatched cottage in Milton Keynes Village (1971). Item: Photograph of Milton Keynes Village house (1971). Item: Photograph of large cottage in Milton Keynes Village (1971). Item: Photograph of Milton Keynes Village road towards pub (1971). Item: Photograph of abandoned farm between Milton Keynes Village and Willen (1971). Item: Photograph of funfair at Great Linford (1971). Item: Photograph of Keith Emmett and Son funfair lorry at Willen (1971). Item: Photograph of canal side cottage at Great Linford (1971). Item: Photograph of Great Linford Vicarage (1971). Item: Photograph of Great Linford village properties looking towards the Manor (1971). Item: Photograph of old farm buildings at Great Linford (1971). Item: Photograph of farmhouse in Great Linford (1971). Item: Photograph of farm between Great Linford and Woolstone (1971). Item: Photograph of country lane between Great Linford and Woolstone (1971). Item: Photograph of the beginning of the construction of the road to Stantonbury (1971). Item: Photograph of New Bradwell street with terraced houses (1971). Item: Photograph of New Bradwell Scrap yard (1971). Item: Photograph of barns behind New Bradwell (1971). Item: Photograph of new Bradwell windmill (1971). Item: Photograph of road between New Bradwell and Old Bradwell (1971). Item: Photograph of Old Bradwell fields (1971). Item: Photograph of railway lines at Old Bradwell 1974. Item: Photograph of farm at Old Bradwell (1971). Item: Photograph of farmhouse at Old Bradwell (1971). Item: Photograph of Old Bradwell road junction (1971). Item: Photograph of Old Bradwell village green (1971). Item: Photograph of Bradwell Abbey farm and farmlands Old Bradwell (1971). Item: Photograph of Old Bradwell archaeological site (1971). Item: Photograph of land between Bradwell Abbey and Stacey Hill Farm (1971). Item: Photograph of Bradwell Abbey farmlands (1971). 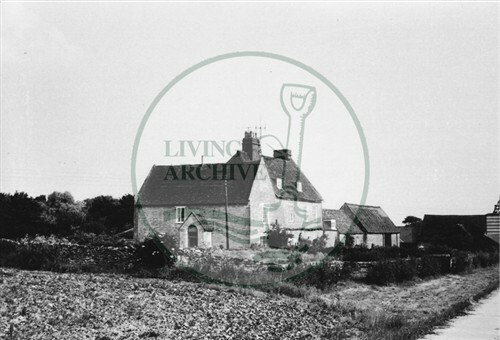 Item: Photograph of Bradwell Abbey farmhouse and outbuildings (1971). Item: Photograph of Bradwell Abbey Farm (1971). Item: Photograph of Bradwell Abbey 14th Century chapel (1971). Item: Photograph of main road through Old Bradwell (1971). Item: Photograph of Old Bradwell nursery gardens (1971). Item: Photograph of Old Bradwell derelict nursery gardens (1971). Item: Photograph of Vicarage Road Old Bradwell (1971). Item: Photograph of Old Bradwell (1971). Item: Photograph of Old Bradwell cottages (1971). Item: Photograph of Manor Farm Old Bradwell (1971). Item: Photograph of Old Bradwell Manor Farm barn (1971). Item: Photograph of Old Bradwell graveyard and fields (1971). Item: Photograph of Old Bradwell church and Manor Farm (1971). Item: Photograph of fields taken from railway bridge at Old Bradwell (1971). Item: Photograph of road going over Old Bradwell railway bridge (1971). Item: Photograph of site of Greenleys Estate taken from railway bridge at Old Bradwell (1971). Item: Photograph of road towards Loughton (1971). Item: Photograph of railway lines taken from Old Bradwell bridge (1971). Item: Photograph of Loughton Manor Farm (1971). Item: Photograph of Loughton village(1971). Item: Photograph of Loughton village (1971). Item: Photograph of Loughton upon the Green (1971). Item: Photograph of old school chapel Loughton Upon the Green (1971). Item: Photograph of farm at Loughton (1971). Item: Photograph of fields outside Loughton village (1971). Item: Photograph of lane leading from Loughton (1971). Item: Photograph of fields now Central Milton Keynes (1971). Item: Photograph of derelict farm on land now Central Milton Keynes (1971). Item: Photograph of derelict barn on land now Central Milton Keynes (1971). Item: Photograph of farmland now Central Milton Keynes (1971). Item: Photograph of farmland now Campbell Park (1971). Item: Photograph of farmland behind Old Bradwell (1971). Item: Photograph of farmland near behind Old Bradwell (1971). Item: Photograph of allotments at Old Bardwell (1971). Item: Photograph of Stonebridge Farm New Bradwell (1971). Item: Photograph of road from Wolverton station to New Bradwell (1971). Item: Photograph of old carts at Stacey Hill Farm Wolverton (1971). Item: Photograph of Stacey Hill Farmhouse (1971). Item: Photograph of railway bridge at Stacey Hill (1971). Item: Photograph of farmland at Stacey Hill Farm and the Gables flats at Wolverton(1971). Item: Photograph of fields at Stacey Hill Farm (1971). Item: Photograph of fields south of Stony Stratford (1971). Item: Photograph of heavy machinery in fields south of Stony Stratford (1971). Item: Photograph of building site alongside A5 road at Stony Stratford (1971). Item: Photograph of building site south of Stony Stratford (1971). Item: Photograph of fields being developed south of Stony Stratford (1971). Item: Photograph of fields next to A5 road looking towards Stony Stratford (1971). Item: Photograph of village of Shenley Brook End 1975. Item: Photograph of Westbury Farm Shenley Brook End 1975. Item: Photograph of Kiln Farm south of Stony Stratford 1975. Item: Photograph of Kiln Farm barn south of Stony Stratford 1975. Item: Photograph of Kiln Farm barn south of Stony Stratford (1972). Item: Photograph of Kiln Farm barn south of Stony Stratford 1978. Item: Photograph of Stony Stratford High Street (1971). Item: Photograph of Stony Stratford Church Street (1971). Item: Photograph of Stony Stratford Market Square (1971). Item: Photograph of land outside Stony Stratford (1971). Item: Photograph of Wolverton Road just outside Stony Stratford (1971). Item: Photograph of Warren Farm Wolverton Mill (1971). Item: Photograph of Warren Farm Wolverton Mill Stony Stratford (1971). Item: Photograph of Warren Farm Wolverton Mill 1974. Item: Photograph of Old Wolverton (1972). Item: Photograph of Manor Farm Old Wolverton (1972).